SINGAPORE - Bedok residents can now cycle seamlessly from Chai Chee to Upper East Coast Road, as the neighbourhood opens new cycling lanes. The completion of 13km of dedicated cycling paths makes Bedok the ninth cycling town here, joining areas such as Jurong Lake District, Punggol and Pasir Ris. These lanes are painted red to distinguish them from regular footpaths, making Bedok the second town to feature such red lanes after Ang Mo Kio. The network connects residents from their homes to major amenities in Bedok, such as the Bedok Integrated Transport Hub, Bedok Mall and various hawker centres. It is meant for cyclists and riders with personal mobility devices (PMDs), such as hoverboards and electric scooters. Manpower Minister Lim Swee Say, who is MP for East Coast GRC, opened the completed network at Heartbeat@Bedok on Saturday afternoon (Jan 20). The completed network will help Bedok residents complete their first-and-last-mile journey from home to other amenities, he said. "With the opening of the Bedok network, we hope to bring residents more convenience. But cyclists, please remember, your convenience should not cause inconvenience to other people, so please be considerate on the paths," said Mr Lim. Construction of the Bedok cycling network started in the middle of 2015. The first 5km of the network was completed in December last year and included paths along stretches of New Upper Changi Road, Bedok North Avenue 3 and Sims Avenue East. The network will also be linked to NPark's 4km-long Outdoor Play Corridor when it is completed which connects Bedok Reservoir Park and East Coast Park. This new network also includes more PMD-friendly features, such as bicycle crossings for cyclists and PMD users to use when crossing the road. There are also more bicycle parking boxes at popular, high-traffic areas such as MRT stations, bus stops and void decks, along with wheeling ramps at staircases. The network will be expanded to include new MRT stations on the Thomson-East Coast line in Bedok, such as Siglap and Bayshore, when they open after 2020. 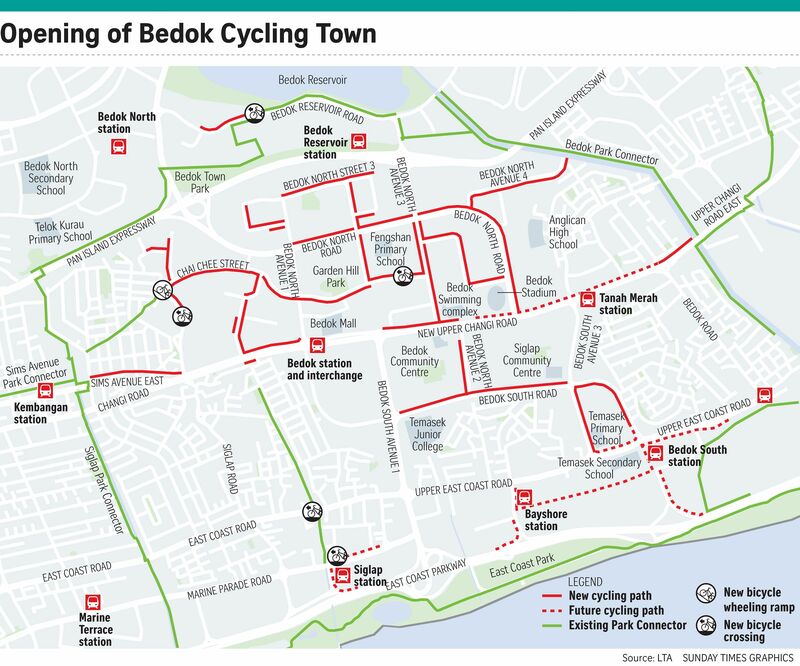 The Bedok cycling town network falls under the Government 's plans to construct a 700km islandwide network of cycling paths by 2030, which will be present in all 26 Housing Board towns. Bedok resident and avid cyclist Jason Lee, 44, said: "The wider paths make it more convenient for me to get around to parts of Bedok to run my errands. "There are also some wider lanes built behind some bus stops, which gives us more space to go around crowds waiting for the bus. It's safer for everybody," he added.